With This Awesome List Building Method! 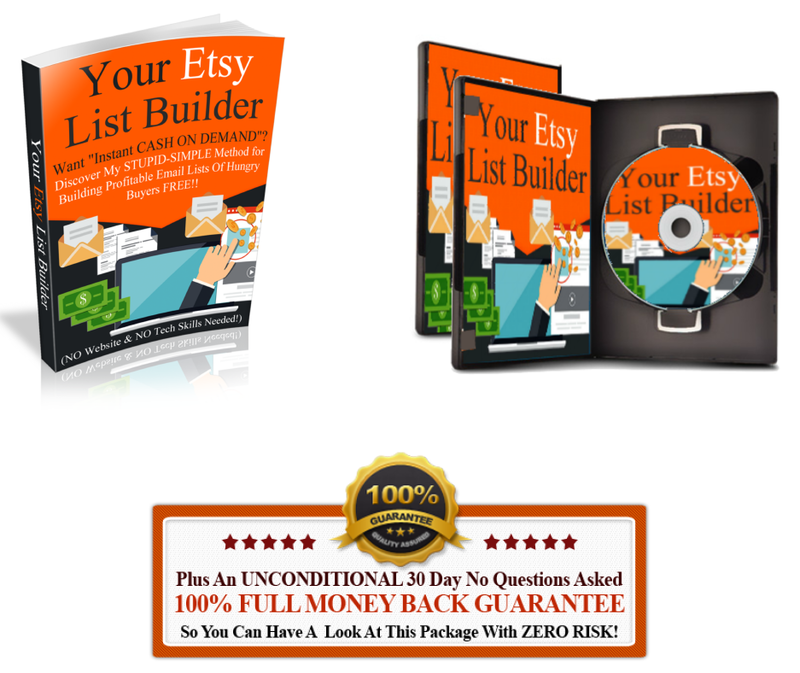 I am going to show you where to get HUNDREDS or even THOUSANDS of ETSY email subscribers at ZERO COST – And how to KEEP them BUYING your ETSY (and OTHER) items again and again and again! Generating CASH PROFITS for YOU over and over and over! Even If Your ETSY Shop Sells Nothing! And I'll show you how to EASILY create attractive opt-in forms FREE with ZERO tech skills! (again, NO website needed!). And Put CA$H In Your Pocket! 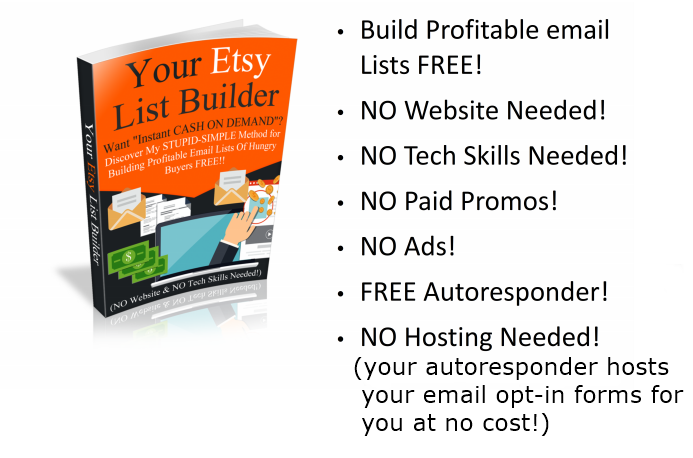 Why Should You Build A List Of ETSY Buyers? MONEY!!... It's a NO BRAINER!! Because they don't know how SIMPLE & LUCRATIVE this is to do!!! Email lists are the only online assets you have that are truly YOURS! without success NOW IS THE TIME TO GET STARTED!!! Even ADD ARTICLES As You Wish!! 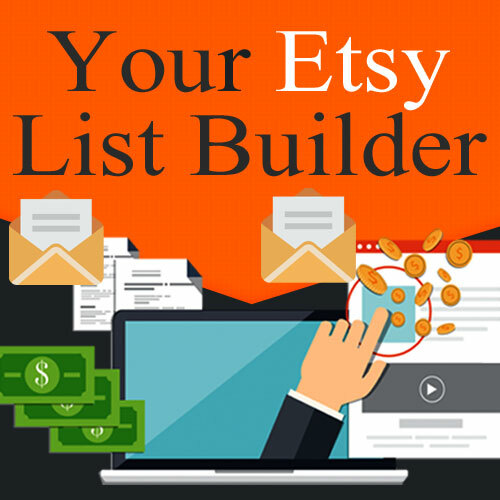 PRESENTING: YOUR ETSY LIST BUILDER! Distributing Your ETSY CATALOGS To Your LIST! FREE using ETSY. The guide presents an easy to follow, step by step method that lets you use the massive traffic pulling power of Etsy to build your own mailing list legally, ethically and without breaking any of Etsy’s rules. I will even show you how to use FREE tools to manage your mailing list with no monthly fees to pay. You’ll have ZERO out of pocket expenses. I will show you how to get people to open your catalog(s) immediately and how to feature any combination of products you wish! I will also share my most private profit generating email marketing secrets that I have acquired through painful trial and error from my 10+ years of email marketing – these are all of the methods and techniques that I use in my own business – (I have NEVER shared this stuff with anyone before). 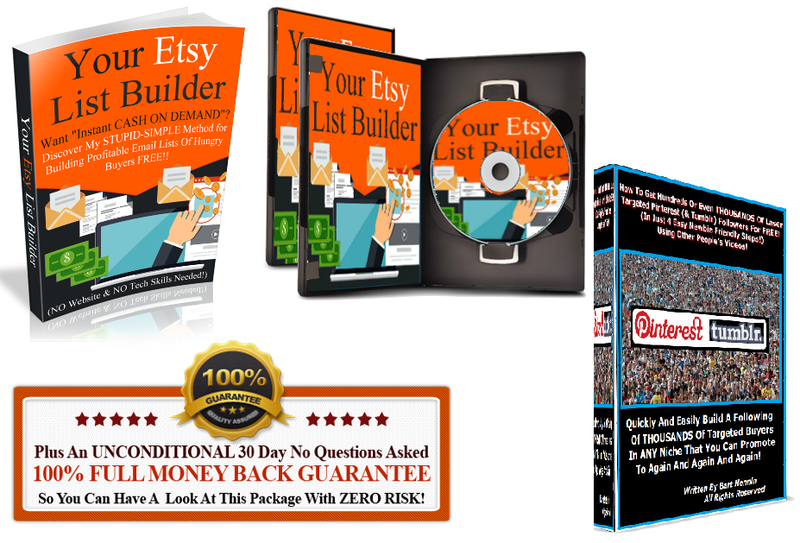 Your Etsy List Builder makes the whole process of building and communicating with your list as simple as it possibly can be, there are no costly tools to buy, no monthly payments to make, you won’t need years of trial and error learning how to write emails that sell and you’ll never need to worry about creating content for your email marketing campaigns. * In fact ANYBODY can do this and if you already have your own Etsy shop you are leaving money on the table if you don’t do this. 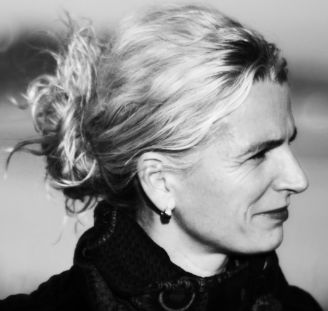 Further, an email subscriber list is the ONLY online asset that is truly YOURS. No website can take your list away from you…ever. With a loyal email list, you can sell to your subscribers again and again and again! which gets you more sales. 3) You are viewed as a serious seller who can be trusted which gets you more sales. 4) You can advertise weekly or monthly “specials”, “coupons”, or “limited time discounts” which gets you more sales. 5) You can instantly announce (and show!) new items added to your ETSY store which gets you more sales. 6) You can prevent your customers from “forgetting” you and keep them thinking of you which gets you TONS more sales. 7) You can get more admirers which boosts your listings which gets you more sales. 8) Catalogs can be shared, attracting even more customers which gets you more sales. 9) You rise above other ETSY sellers which gets you more sales. Best of all, even if you are making only a few or even zero ETSY sales, an email list can open up many other revenue streams for you! 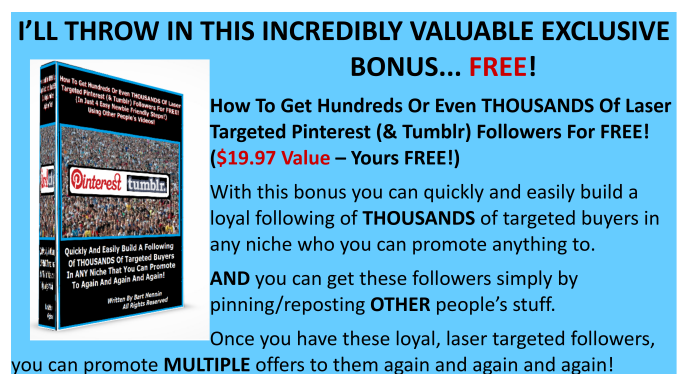 There’s a whole BONUS chapter entitled “Email Marketing Beyond ETSY – Using Your ETSY Email List To Create Additional Income Streams Beyond Just ETSY Sales!” that specifically addresses this! This one chapter ALONE is worth more than the entire course! You’ll learn how to set up an excellent user friendly email autoresponder at ZERO cost. You’ll also learn how to set up an attractive email subscriber Opt-in form with NO website or hosting needed and there are ZERO technical skills required to do this. 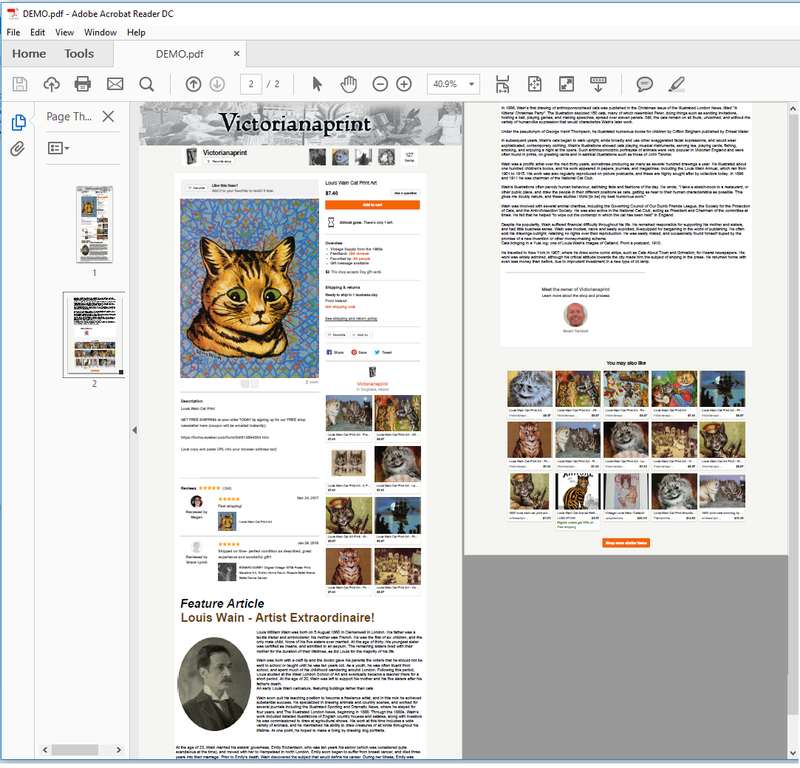 In addition to the amazing FREE online tool that allows you to instantly create PDF catalogs of your ETSY store and/or your ETSY listings, I will ALSO reveal a second free online tool that will allow you to easily merge several single PDFs into one multi page PDF so you can “feature” specific products if you wish. You’ll discover a simple way to use your ETSY shop to start and grow an email subscriber list of people who would like to receive your ETSY listing newsletters/ catalogs. You’ll learn some other easy ways you can [optionally] attract even more email subscribers using Facebook, Pinterest, Tumblr, and some other FREE Web 2.0 resources. I will show you how to use your free autoresponder to host your PDF catalog(s) FREE so your email subscribers can instantly access them without you needing to create “download pages”(NO website needed). You’ll learn how to EASILY create weekly or monthly catalog campaigns, what to write in your emails, and how to keep people engaged and interested in what you have to offer (so they will actually look forward to receiving their catalogs with excitement!). I will also reveal to you my PERSONAL email marketing success secrets that I have never shared with anyone before. This includes my best methods, most successful strategies and includes examples. PLUS! – I will reveal how (with your list) there are even greater profits to be made BEYOND ETSY using Amazon, ClickBank, Zazzle, JVZoo, etc. [this is optional but the info is there if you want to expand and diversify your profits]. And Don't Forget Your Included 30 Day FULL MONEY BACK﻿ GUARANTEE!! ...We take all the risk FOR YOU!! "I have had a store on Etsy for four years, and have been quite successful, but I never did anything to collect email addresses. Now I want more control over my business, and that means having a mailing list. I tried expensive Facebook ads but I didn't get a single signup. Then I found 'Your Etsy List Builder' and I had immediate results. The first day I used the system, I got 6 signups, and 25 in the first week. Since then, my list has continued to grow! What I love about it the most is that once you set it up, it is on autopilot. I get signups without having to do anything and it doesn't cost me anything. This is a great system!" TESTIMONIAL UPDATE - "I now have 350 subscribers on my list and I'm well on my way to achieving my aim of having more control over my business!" AND TODAY WE'RE DRASTICALLY CUTTING YOUR PRICE!!! REMOVE unwanted pages (or ADD pages) as you wish! WHITE OUT sections of pages you don’t want! ADD headlines, images, text (even professional looking articles) if you so wish! 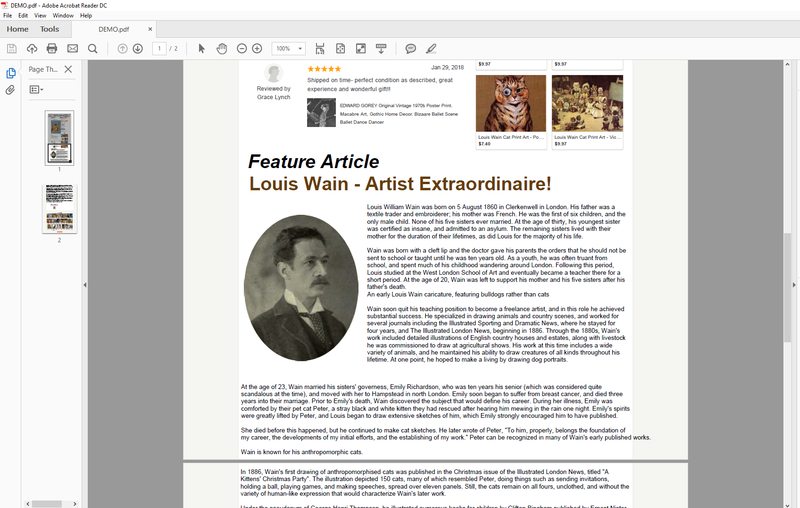 That last feature is handy for adding in short “info articles” to your ETSY catalogs which will get more people opening them! YOUR OWN EMAIL LIST DOES NOT HAVE TO BE COMPLICATED!!! projects at the same time! 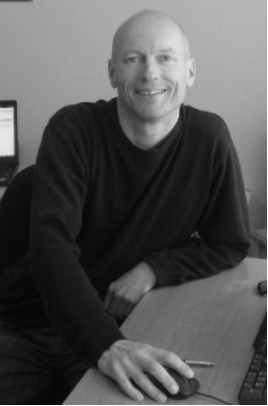 I show you how to set everything up for ZERO COST using FREE TOOLS so you are not on the hook for any money outlays or costs whatsoever (These are the secrets the so called “gurus” don’t want you to know). Even your autoresponder is FREE!!! 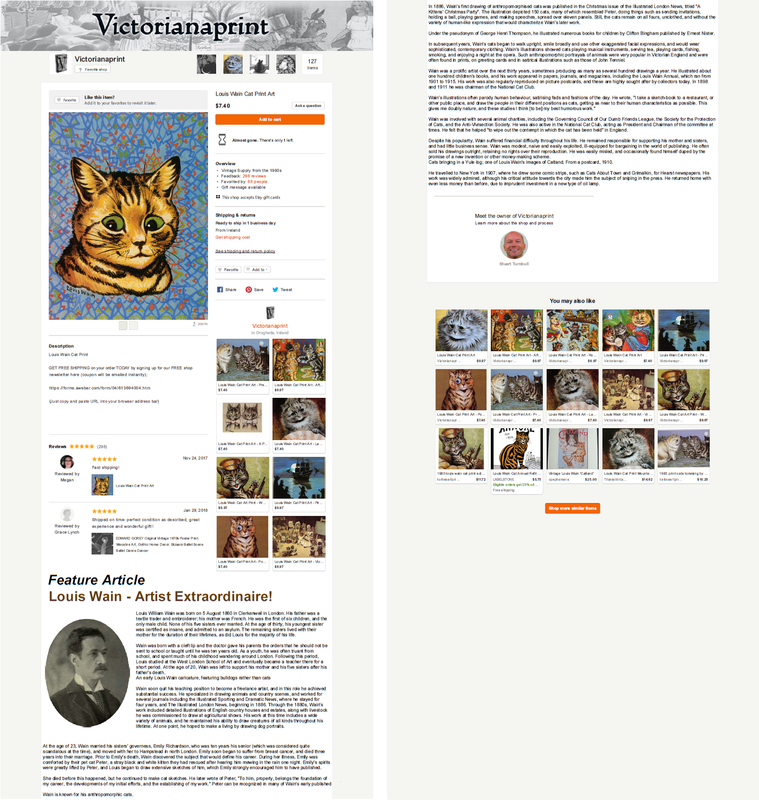 This one is the charm…With the ability to distribute live catalog versions of your ETSY listings [Or EBAY listings/stores or ZAZZLE listings, or ANY WEBSITE store!!] you can send out emails that feature new items, themed items, special priced items, Just added items, Most popular items, etc, etc! Produce And Take Just Minutes To Create! I even show you how to get people to want to OPEN your pdf catalogs IMMEDIATELY! And all the links in your Pdf catalogs are LIVE so people can buy your ETSY (or other) products right from the PDF! prospect lists since 2008 and the earning power.. freedom.. and ‘peace of mind’ that my mailing lists give me cannot be overstated. month with just a couple of emails I am in complete control of how I spend my time….and with the info I reveal here YOU can do the same! I could go on and describe the 23 years I spent working a dull office job to pay the bills, the nightmare of nearly a quarter of a century doing what other people told me to do but I’m sure you don’t need me to remind you what that feels like. It is a fact that money=power and if you can find a way to become financially self sufficient you have the power to live your life on your terms and today you have the opportunity to take the first steps on your own road to financial self sufficiency. EASIER! ... ETSY has arrived on the scene! Currently, Etsy is at number 8 on the list of the top ten ecommerce sites in the world with over 44 million unique visitors every month! Getting even the thinnest slice of that pie can set you up for life! BUT here’s the thing…Most Etsy sellers are so busy making one time sales that they are losing out on the multiple repeat sales an ETSY email list can provide! Well for YOU that ends TODAY…. A fully detailed comprehensive PDF training guide that reveals everything you need to know (in easy to follow step by step fashion) to build profitable email lists, create professional, attractive PDF catalogs and PROFIT handsomely! 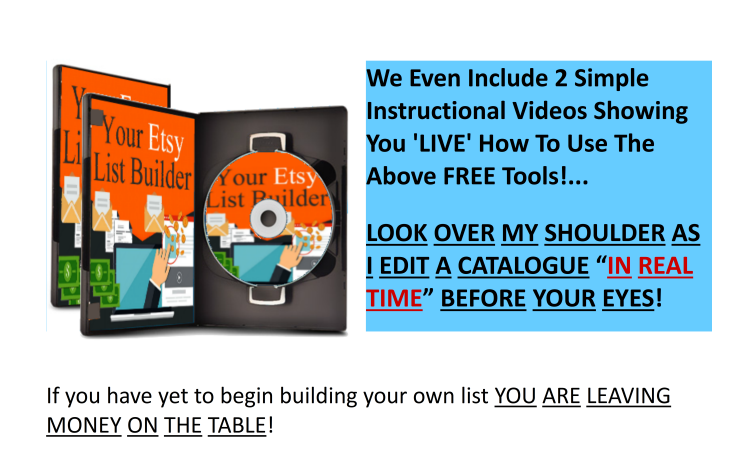 2 Easy To Follow VIDEO TUTORIALS that let you look over my shoulder as I create an attractive catalog right before your eyes 'LIVE' in REAL TIME! A FULL 30 DAY 100% REFUND GUARANTEE! AND THE ABILITY TO CREATE ATTRACTIVE MONEY MAKING PDF CATALOGS LIKE THIS (With LIVE BUY links!) QUICK & EASY!! So you get $163.97 worth of value for this TINY one time payment!